On March 24, BET will air a special on criminal justice reform called American Injustice: A BET Town Hall hosted by Soledad O’Brien. The veteran journalist will be speaking with everyday American citizens, members of the Congressional Black Caucus, other lawmakers, and activists. Among the panelists are Senators Kamala Harris and Cory Booker, both of whom are vying for the Democratic 2020 presidential nomination. As a former prosecutor, Harris’ record and positions on criminal justice have been a significant focus in interviews since she announced her candidacy in January. Viewers will also be interested to see what Booker, who was a media darling during his tenure as mayor of Newark, NJ, will have to add about an issue that is high a top the concerns of African American voters. Booker was instrumental in getting sentencing reform provisions added to the recently passed First Step Act. The legislation reduces mandatory minimum sentencing for non-violent drug offenses. It also tweaks the federal “three strikes” rule by swapping mandatory life for 25 years when offenders reach their third conviction. Criminal justice reform organizations like the Brennan Center have lauded the legislation as a step in the right direction. With political news like that, a growing movement to end cash bail, and national discussions on probation and parole reform prompted by high profile cases such as rapper Meek Mill, the town hall is a timely discussion on an important topic. Other panelists include Rep. Val Demings (D-FL) and Congressional Black Caucus Chair Rep. Karen Bass (D-CA). 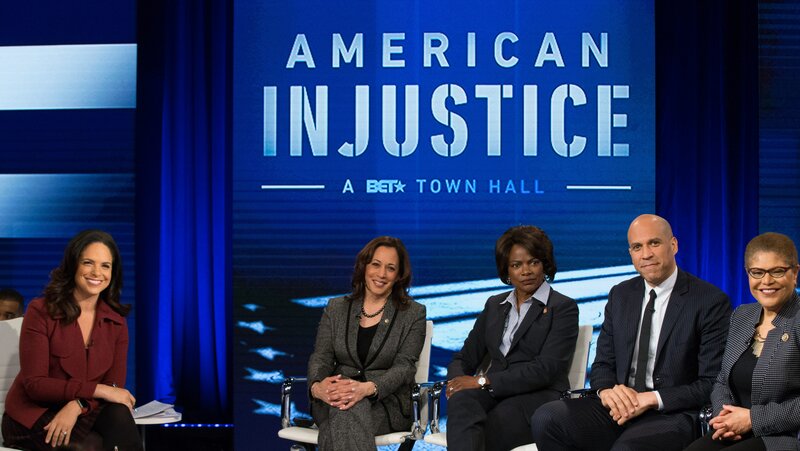 American Injustice: A BET Town Hall, a one-hour long primetime special airs on Sunday March 24 at 9 pm (ET/PT) on BET.